Nothing screams Super Bowl Sunday like food and beer, and this German style food hall specializes in just that, making it a great place to watch the big game. Snacks at Der Wolfskopf will be cheap too, with $3 tots and $3 pretzels. This place has a large center bar, with wall-to-wall views of the game, and some of L.A.’s best whiskey/bourbon/scotch. From kick-off until the last play, they’re offering $5 draft beer. If you’re looking to watch the game in more of a classic sports bar setting, Surly Goat is the place to be. The bar will be offering Super Bowl squares for $10-$20 if you’re looking to place some bets. Along with a $51 open bar (optional) for the duration of the game, they’ve got a huge selection of craft beer. If there’s one thing that is a must on Super Bowl Sunday, (well, other than football) it’s beer. Little Bear is famous for their Belgian-style import and domestic beers. For $10 get a Dew & Brew, which is a shot of Tullamore Irish Whiskey and a pint of Bavik Pilsner. Game on. Need a half way point between sports and swanky? Bunker Hill Bar & Grill is just that, combining a little bit of both bar elements. You can get anything from bar-food staples like wings and tacos, to sushi and burritos. The big game can be watched from the indoor dining area or the outdoor patio overlooking the city. On game-day, enter raffles for fun prizes and enjoy yard glasses of any draft beer for $10 or lagers for $5. Beer lovers will feel at home at Blue Palms Brewhouse, where brews from all around the world are served. In addition to your usual bar grub, you can choose from a menu of exotic sausages to pair with your drink. Worried to leave your dog at home during the Super Bowl? Fat Dog’s got you covered. The dog-friendly restaurants provides extra TV’s so you can watch football on the pet-friendly patio. And while your pup is getting into the game, you can get into their happy hour, which offers $5 well drinks, $3-$4 ciders and beers, $4 wine, and snacks under $7. In the mood for some classic comfort food during the Super Bowl? Head to Plan Check Kitchen+Bar for their signature culler donuts and unique cocktails. Their Super Bowl Sunday menu also has wings and nachos, and drink specials for a $5 Old fashioned, $2 Pilsner, and $4 wine. 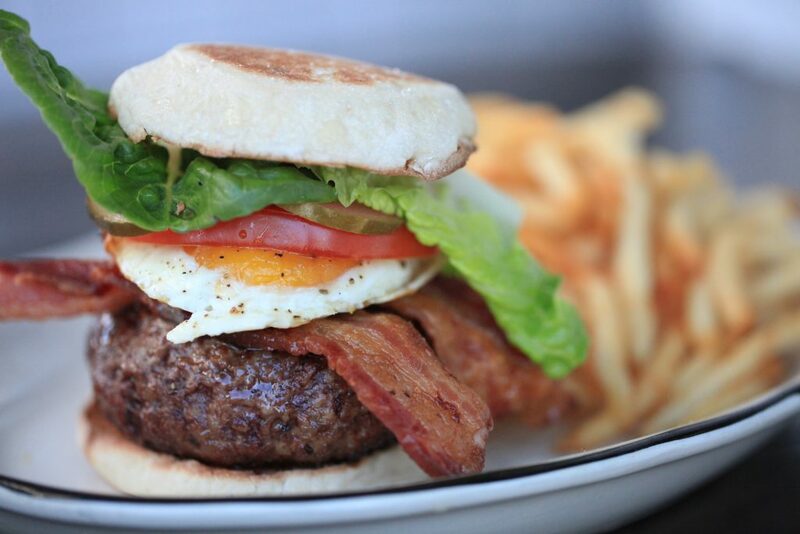 Watch the Super Bowl while eating the famous Bowery Burger. Then wash it down with specialty beers on tap dedicated to the Patriots and Falcons, so guests can drink to their favorite team while watching the game unfold on Bowery’s TVs. Their happy hour runs from 4 p.m.- 7 p.m. and again from 11 p.m. to close, where well drinks are $5, canned beer is $4, and $2 off glasses of wine. 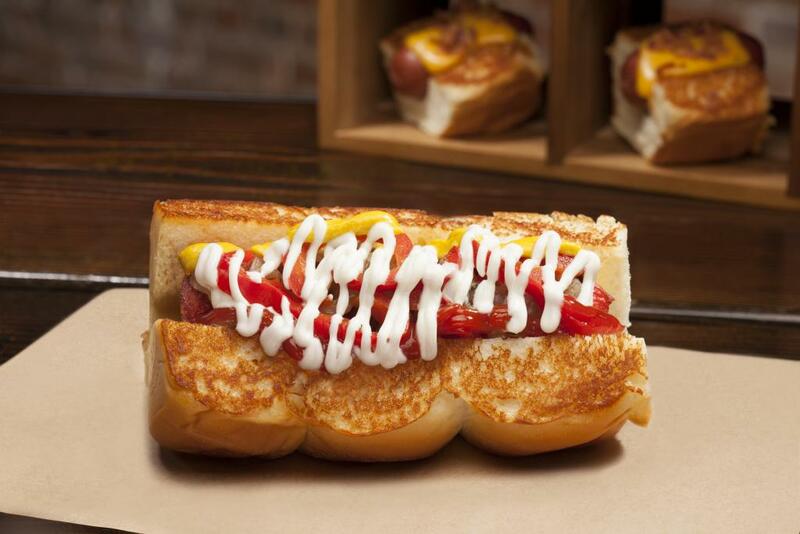 Loved for its gourmet takes on hot dogs, sausages, burgers and its extensive beer program that spotlights local brews, Dog Haus is the perfect setting for any meat-lover to watch the game. They’ve also got an all-day happy hour this Sunday, where you can enjoy 2-for-1 beers, $4 well drinks, $2 off specialty cocktails, and sliders, fries and tots for $1.29.